"Pam Kelley knows a good story when she sees one--and Money Rock is a hell of a story. . . like a New South version of The Wire." Meet Money Rock. He's young. He's charismatic. He's generous, often to a fault. He's one of Charlotte's most successful cocaine dealers, and that's what first prompted veteran reporter Pam Kelley to craft this riveting social history--by turns action-packed, uplifting, and tragic--of a striving African American family, swept up and transformed by the 1980s cocaine epidemic. The saga begins in 1963 when a budding civil rights activist named Carrie gives birth to Belton Lamont Platt, eventually known as Money Rock, in a newly integrated North Carolina hospital. Pam Kelley takes readers through a shootout that shocks the city, a botched FBI sting, and a trial with a judge known as "Maximum Bob." When the story concludes more than a half century later, Belton has redeemed himself. But three of his sons have met violent deaths and his oldest, fresh from prison, struggles to make a new life in a world where the odds are stacked against him. This gripping tale, populated with characters both big-hearted and flawed, shows how social forces and public policies--racism, segregation, the War on Drugs, mass incarceration--help shape individual destinies. 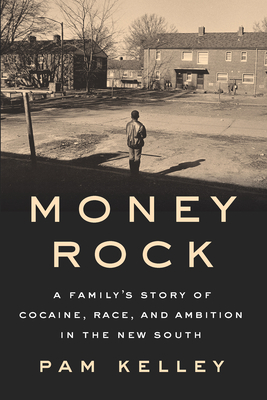 Money Rock is a deeply American story, one that will leave readers reflecting on the near impossibility of making lasting change, in our lives and as a society, until we reckon with the sins of our past.